"In France," Isha was saying, "French toast is called Pain Perdu, which means "lost bread" in French." "And rightly so, as it was this French "eggs-pertise" which found a way to rejuvenate their stale bread." Hosh laughed. He liked the way his mother told him all these interesting things while showing him how to cook. "Various versions of French toast," she continued, "were prepared throughout Europe in the Middle Ages." "But now, it has become a popular global dish because it is cheap, quick, easy to make, versatile and delicious." "Did you know that in 2011, Hong Kong–style French toast was listed at number 38 on the World's 50 most delicious foods compiled by CNN Go." "It is made by deep-frying stacked sliced bread dipped in beaten egg or soy, served with a slab of butter and topped with golden syrup, or sometimes honey. Two slices are normally used and a sweet filling is usually added." "In fact, most global versions of the French toast are simply slices of bread soaked or dipped in a mixture of eggs beaten up with milk or cream. These slices of egg-coated bread were then fried on both sides until they were browned and cooked through." "You can top up your cooked slices with jam, marmalade, butter, nut butter, honey, Marmite, Vegemite, maple syrup, golden syrup, fruit flavored syrup, molasses, apple sauce, baked beans, whipped cream, fruit, chocolate, Nutella, sugar, yogurt, icing sugar, bacon, treacle, tomato ketchup, cheese, cold cooked meats, ice cream, gravy, various nuts, or anything else that takes your fancy before serving." "Beat the milk," Isha instructed, "eggs and cinnamon in a shallow dish until they are well blended. Heat the oil or butter in a fry pan over medium heat until it is sizzling." "Now dip the bread slices quickly in the egg mixture, making sure both sides are coated. Do not soak the bread. Cook the coated bread on both sides on the fry pan for 2-3 minutes each side or until it is golden brown. Serve immediately." "But Ma," asked Hosh, "won't they be freezing cold in winter by the time I've cooked them all?" "How many would you be cooking?" laughed Isha, "One slice of toast bread is enough for one serve. But you can drain them on a paper towel, and keep warm in the oven while you make the rest." "If you are really hungry, you can make Stuffed French toast too, which is a sandwich of two pieces of French toast filled with bananas, strawberries, or other fruit. 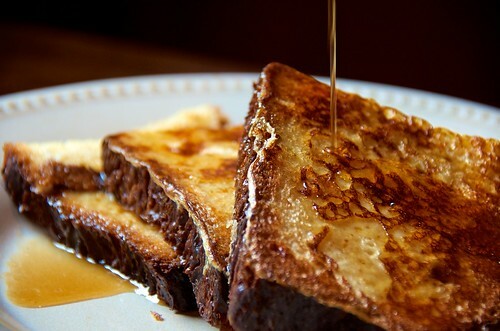 It is usually topped with butter, maple syrup, and powdered sugar." "Some old-timers garnished them with crispy bacon and sliced bananas or fruit of choice to make a complete meal out of their breakfast. Eggs are full of goodness anyway, like proteins, vitamins A,B,D and E, lots of minerals and those very important good-for-you fatty acids." "Basically," she replied, relishing her breakfast, "eggs need to be ideally stored between 7 – 15ºC, with cellophane wrapper removed. If you cannot store eggs out in the open in this temperature range, you may need to store them in the fridge, especially during summer or in times of high humidity." "It's best to avoid temperature fluctuations, as this causes the eggs to spoil faster. And don't take them out of the fridge and put them straight into boiling water. You'll crack them up." "Store eggs in the cartons and trays that they come in as these are designed to protect them from damage and to prevent them from absorbing moisture. Egg shells are porous, so it pays to store them away from strong smelling odors and flavors e.g. fish." "Use eggs before the "best before" dates marked on the packs. This date indicates the length of time that the eggs will maintain their quality if stored correctly."